Check out what Nintendo's Eiji Aonuma, best known for directing and producing multiple Zelda games, just sent 3DS owners via Swapnote, the system's text and picture messaging application. "Hello, this is Aonuma, Nintendo's Legend of Zelda producer," he says in the note. "Did you enjoy The Legend of Zelda: Ocarina of Time 3D? Thanks to everyone, the Legend of Zelda series had a very happy 25th anniversary. I hope you're looking forward to new Legend of Zelda games." Nintendo has not yet officially announced any new Legend of Zelda games for 3DS, but it's reasonable to assume that at least one is planned for the near future. Zelda is one of the publisher's strongest franchises, one that has made multiple appearances on every Nintendo system thus far (except the Super Nintendo, where it only landed once, as Kotaku commenter LordDisco points out). Aonuma has also expressed interest in bringing The Legend of Zelda: Majora's Mask to 3DS. 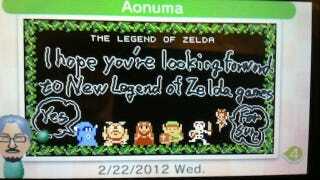 To access Aonuma's note for yourself, just open up your 3DS and download the Swapnote app, if you don't have it already. Activate SpotPass and you should receive the letter, which is decorated with adorable little images of The Legend of Zelda's 8-bit sprites. We've reached out to Nintendo for comment and will update if we hear anything official. For now, we'll just have to settle with a tease.